English journalist and author Robert Chalmers is an interesting fellow, as I learned while being interviewed by him recently. He’s a man of refined aesthetic judgment and wide-ranging cultural curiosity who sounds, on the telephone, like one of those portly, slightly bibulous character actors from black and white British films of the 1930s. (I have no idea how well this impression corresponds with reality—he does not google easily.) Chalmers is on good terms with Elvis Costello, jets off to the Cote d’Azur to interview famous actresses, and since adolescence has been a devotee of fragrances by Creed. Chalmers has now published a greatly expanded—and more leisurely and nuanced—version of his European Newsweek story as an ebook. 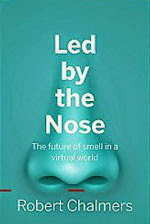 In Led by the nose: The future of smell in a virtual world, he tracks down the inventors of the latest digital smell technologies (Scentee’s Adrian Cheok and the oPhone Duo’s David Edwards) and tries to envision the changes they may bring to society. He sets this narrative against a lively and humorous depiction of perfume culture. Along the way he manages to heap praise upon What the Nose Knows. Consequently, I can’t pretend this is an impartial review. But I can say that Led by the Nose is an amusing and inexpensive read for anyone who likes perfume and/or is intrigued by the future of scent technology.